Have been going to Jonh's for years and have always had the best of service. I've never been to a better auto care place! These people rock. Came here for a car alignment, super friendly staff and fixed my car! Reliable. Get their work done at John's. Great service. Quality work at a great price. You could win 2 movie passes, and a $20 gift card for Longhorn Diner, a free full service car wash from Stadium Car wash, amongst other prizes! Welcome to John's Automotive Care, your EXPERTS in full service auto repair, truck repair and vehicle maintenance in San Diego CA and surrounding areas. We're dedicated to delivering customer satisfaction! We provide everything from oil changes to the most intricate repairs imaginable. No matter what automotive problem you may experience, you can depend on us for quality professional service. Your satisfaction is our top priority! John's Automotive Care has been providing quality car repair, service and maintenance in San Diego, CA. since 1998. We are a locally-owned family business dedicated to delivering quality and professional automotive services to our friends and neighbors in San Diego and surrounding areas, including La Mesa and Tierrasanta. Our highly professional ASE (Automotive Service Excellence) Certified technicians are skilled in the latest automotive technology and are equipped to handle all major and minor repairs on foreign and domestic cars and trucks. We understand that your car or truck is a major investment, and that is why we care for each customers vehicle as if it were our own. We know you have a choice when it comes to getting your vehicle maintained or serviced. That’s why our goal is to give complete customer satisfaction. Our technicians work together as a professional, efficient team with honesty and integrity. Whether you own a car, SUV, light truck, or entire fleet, our technicians use the most up-to-date diagnostic equipment and quality parts & products while meeting all of your automotive maintenance needs. Our quality ASE certified mechanics in San Diego, CA. employ today’s latest automotive technology and are equipped to handle all major and minor auto repair services on foreign and domestic vehicles. Our technicians can expertly diagnose whatever problems you might be experiencing with your vehicle. We have the latest high-tech diagnostic tools and our expert technicians know how to use them! Check out the vehicles we repair! Welcome to John's Automotive Care! As the go-to auto repair shop for San Diego drivers, we service and repair both foreign and domestic vehicles. Our auto mechanics will thoroughly inspect your car for any issues that could jeopardize you or your passengers' safety. Our genuine concern for you won't waver throughout your entire visit. You will be greeted with a warm smile when you walk through our doors, and you will be walked to your recently-repaired car with a pat on your back. We perform a full inspection on every car that comes into our San Diego auto repair shop. Our auto mechanics will inspect your car from bumper to bumper. When we service your vehicle, we like to have a comprehensive picture, and these inspections are the best way to accomplish this task. During the inspection process, we make sure to take detailed pictures to share with you. Together, we will decide on a course of action best suited to your car's safety and longevity, along with your budget. Our auto mechanics are certified, experienced, and educated in servicing virtually every vehicle make and model. 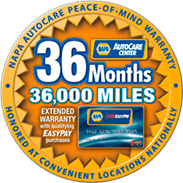 Plus, our work is backed by the Napa Auto Care Peace-of-Mind-Warranty of 36-months/36,000-miles. We are friendly, personable, and eager to help any way we can. We listen to you and we try our best to eliminate any headaches. We offer a free shuttle service, as well as rental cars at discounted rates. After your car is serviced, we will follow up with you to make sure all is going well with the auto repairs performed. Above all, we strive to go above and beyond for you, your family and your vehicle. We have a “treasure chest” full of fun surprises for your little ones, treats for your doggie companions, and chocolate for you. Our waiting room is comfortable and boasts a kid's play area. At John's Automotive Care, we want your experience with us to be terrific. When your vehicle needs auto repair, John's Automotive Care is here to help. While our auto mechanics service your vehicle, you can sit back, relax and feel confident your car is in capable hands. We go above and beyond for you, whether that means offering your pup a biscuit, providing you with a thorough, detailed vehicle inspection, or walking you to your car after its serviced. To schedule an appointment at John's Automotive Care, call us. We are located at 6267 Riverdale St, San Diego, CA 92120. We're Always looking for Auto Industry Superstars! John’s Automotive Care is always on the look out for top technical and clerical talent to join our team. We are a LARGE, constantly growing, team oriented, AAA approved shop that has had great success by taking care of both the customers AND employees. Isn’t this an environment YOU would want?